Quaddies.....3 out of 4 for Syd. Testarythm SR5/8 and Quaddie paid $11,591 (NSW Tab). Total of 5 Quaddies (incl Scone) return $19,030. I spend $15-$18 per Quad for a 2-4% flex return. i.e outlay $101 return $449. Thanks.....see u at Royal Pines. Have you considered breeding your own racehorse. We raced Hot Fox trained by Joe pride and she won 3 races at Kembla Grange, Gosford and a city win at Canterbury from 1100m to 1300m. Stakesmoney of $50,370 from 15 starts over 2 seasons. Her racing career is over but she is being syndicated as a broodmare and will be heading for Queensland to go to Bradbury's Luck in next years breeding season. 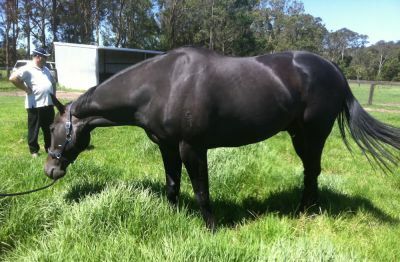 She is a lovely mare and her foals will race in Queensland. Your opportunity is as follows. A 50% share is available for a total of $2500 plus GST. The other 50% will be owned by PC Racing the breeder and owner of Turffontein before he was sold to Blue Gum Farm where he now stands. Take into account the additional cost of agistment plus veterinary costs, breaking in etc until the foal races which will be in 2016. It is however a cheap way to invest in a race horse and a broodmare that could produce many foals over the next 5-8 years. She is by Lionheart out of a Scenic mare which have proven very successful at stud. The current owners are only interested in racing horses hence the decision to dissolve their interest. If you have any queries on prospective costs and require more information please email us via the website. A great day for our punters overall with 12 winners from our top selections at a 30% strike rate. Melbourne and Sydney were not kind to us but the other states made up for it. We had an incredible 16 trifectas from our top 5 selections at a strike rate of 40% plus 8 first fours. We only missed the winner in 5 races out of the 40. Our specials were dissapointing with 1 arriving from our 4 selections and the other 3 all very close seconds. I'm still not sure how they didn't win. Thankfully our best each way for the ladies did win and paid $16.20 which got a couple of our subscribers into the black. Hope you managed to find a winner or 2. Scratchings today have had a significant impact causing many changes to our early ratings. Make sure you have picked up the changes. A hot day in Perth could cause more scratchings when finals are announced with an expected 41 degrees good trainers won't risk their good horses. Mind you the fields are at mid week standard bar for one race. at all up odds you will get $21.00 after scratchings. If you take the 4 all up and parlay 3 of them you can't go wrong. Hello again as we are about to farewell another year……Scary how quick they seem to roll on by so enjoy this thing called living as much as you can because I’m tipping when it’s over, its over! Doomben and some good racing on offer tomorrow with a couple of feature races. The track copped rain on Tues night / Wed morning which has it a dead 5 now but the radar looks ugly with thunderstorms about. Parts of the Sth East got smashed today but Doomben missed it all. Hard to know exactly what will get served up to us tomorrow but you already know my thoughts on trying to back a winner on rain affected tracks. The good news for us I guess is each of the 4 stable runners have some form on rain affected tracks. Heza Jetsetter is taking on the Group 1 winner in Sizzling so fair to suggest that’s gonna be an enormous challenge. That’s reflected in the market with the fav at tomato sauce odds of $1.60 and our Jet Spur lad at $26 bucks. He is coming back from a good strong win over the mile and a bit of a freshen up for the 1350 so a bit of the unknown I guess but gee the bugger is feeling well and his work has been , well explosive as he’s got plenty of ‘mojo’ happening. Whether he’s good enough to win this is the big question but I have a sneaky feeling he can run a huge race tomorrow if things go well for him. He has won in the wet so a bit of rain about won’t bother him at all. The days feature race is the $200k Bernborough over the mile. Fillydelphia was desperately unlucky last year to be nosed out in a photo so she’s back for revenge. They have given her top weight and the outside gate so very hard for her to win, especially if the track deteriorates. I don’t really know what Michael Cahill can do on her….just ride her back and hope the tempo is solid enough to allow her to get home but tough to see her winning. I can say though that I reckon we have her back to somewhere near her best though. Fire Up Fifi, well this does look a race she can win. The 57 is still a good horses weight though and the most she has been asked to carry and of course the class of the race is right up there with a number of winning chances and the Villiers runner up in Almas Fury will be extremely hard to beat with Boss on! This is Fifis best distance though and I am happy to say she is in apple pie order for this race. The good gate can see Wiggo have her just fwd. of mid field in the run with cover and if he can get her to the outside at the right time, well, she will be coming strong …..I hope! The last of the day and the ever consistent and at times a bit unlucky, Sons Of God is trying for back to back wins . His last win was a cracker and very dominant and I feel he hasn’t gone backwards since then. He will look as good as anything in the mounting yard. The outside gate makes it a no brainer that we will have to just go forward but that’s what he did last time anyway. The favourite, Someday was unlucky last run and will take beating but I think Soggie can give us a good sight. It’s a big field so tempo and luck will be important but I think the $5.50 on offer isn’t bad each way value. Anyway, thanks for your support through the year and I hope we have brought some pleasure to you at times. Probably time now to consider your New Year’s Resolution…. An excellent day with 15 winners , 14 trifectas and 9 first fours. 2 winners and 2 seconds from our 4 specials so most people got a result. Be wary today with a slow 7 at Eagle Farm and a slow 6 at Rosehill. The first wet tracks for a number of weeks in these states and that generally means form goes out the window. Dont be hesitant to look wide if the form is missing in the early races. The Pinjarra meeting in the west is also second grade so that form is suspect and boxing day can be a day for roughies at this venue. I hate to say it but Adelaide and Melbourne look the best options. SR 5/4 My Sabeel should relish the wet going. Race 3 and Bevico Girls gets a good chance to get back into the winners stall. The 1800 is a bit of a query but I reckon she will get it . The good draw will give her a lovely run with cover and she can win. Race 4 and the stable has two good chances in Tiger Jet and Quantum Shadow. Tiger Jet was very good at his debut and with that run under his belt he should be right in this up to heres ears. Quantum Shadow ran a shocker at his last run but hes better than that. He is a deep thinker and the bugger has to be racing right up on the bunny to concentrate. Pretty Face is gonna be damned hard to beat as its ran 4 2nds from 5 starts and Wiggins chose it as his ride! Race 5 and again a couple of stable runners line up in the maiden and both have a stack of ability and will go onto better things in time. The tipster is right and Smasher does have a bit of a wrap on him from when he first came into the stable . He was impressive beating Sizzling in a recent grass jump out and word got out who he was so he will be short. Gleesonator is not to be underestimated and he has the benefit of experience which always counts for a lot. Don’t agree with tipster on his first up run as he went shin sore! Smasher has never been placed under the hot pressure of a race so it will be interesting to see how he copes. We have been patient with these two lads as they needed the time but both are talented. Race 6 and Vacallo is consistent and racing well but he can be a right bugger of a horse. Quiet calm and downright lazy at home and on the training track and on race day he can be a lunatic and right barrier rogue. You never know what you will get. This is a tough race and he’s a bit on notice over the 1500. He’s a watch and see job for me ! Dean and Kerry Cox announced today the arrival of their first child Charlotte Ivy Cox born 3.8kgs. All doing well. Can't wait for the celebrations. Tough day for winners but still managed to find 9 @ 23%. Good day for the novelties with 15 trifectas @ 38% with some nice dividends. Specials were poor unfortunately with only 1 of the 4 saluting the judge. A merry Xmas to all our customers and hopefully you get everything you hoped for when Santa arrives, preferably another month's subscription to Warch Racing. Hello again and Seasons Greetings to everyone. Well, where the hell did that year go? I gotta admit it has been a bit of a blur but the life of a busy trainer is like that anyway. It has been a very good year for the stable with of course the highlights being the group 1 wins of Woorim in the Oakleigh Plate way back in February and then big Solzhenitsyn winning the Toorak Handicap at Caulfield. There have been many other personal highlights throughout the year but to be honest, every time a stable runner wins it is a highlight and a buzz that I never get tired of. Your horses may or may not have had a good year but I can assure you it has not been for want of trying and as we see so often , most horses do indeed need that main ingredient that BART always emphasises and that is patience and of course the required ability. I have been delighted to see so many of the stable runners emerge from the clouds and achieve very good levels of success. The emergence of horses like Solzhenitsyn, Fire Up Fifi , Excellantes, Griffon, Hidden Kisses, Heza Jetsetter, Racing Heart and more recently Endless Shadow, Sons Of God and Tail and All as they have developed into Saturday metro performers but looked limited earl y in their careers. We have some lovely lightly raced 3 year olds and the 2 year olds headed by Greytfilly are doing super atthis stage of the season. Yes, I am usually optimistic at the best of times but I AM excited for the future . This year has seen a new on course stable barn and I am over the moon with how the transition has taken place. I was a little apprehensive when I moved out of my old stables as we had plenty of success from there but the transition has been great with the winners flowing freely from the ‘NEW BARN’. I want to take this opportunity of acknowledging my hard working staff. Michael and Tom do a super job running my Mein St and On Course stables and Melissa has had a great year with all of our interstate successes and being right there on the front line helping me out on race days and with the tireless task of booking jockey’s. Each and every member of my team are vitally important to the stable success and it’s a work culture that I actively encourage and work towards . Sophie has been a new addition to the office this year and doing a great job easing my heavy work load as we do pride ourselves on stable communication and organisation. We are having a staff xmas drink at the stables after the races on Saturday (21st) and you are welcome to come and join us but best let us know so we don’t run out of booze? Chris, the wonder Farrier and chef is knocking up a smoked bbq for the staff so not sure there will be enough but welcome anyway……. Anyway, a huge thanks to you all for your continued support and I believe I am lucky as they say if you love what you do you will never have to work another day in your life and I reckon I am in that category! I always have a chuckle when the festive season comes around and everyone is in party mode and no bugger wants to work ! Guess what, we have over 20 runners in the coming week so yeah, we are pretty busy and a few staff away on hols so its head down and bums up in our camp………. Let’s have a quick look at what’s running in town on Saturday and see if we can find some Christmas cheer. Race 1 and Endless Shadow fly’s the flag. What a super job this diminutive little mare has done this prep. She has progressed nicely through her grades and she’s now shooting for 4 in a row in town. She is well place getting into this race a kilo under the minimum so she is going to be competitive in this. I agree that she is a justifiable $3.60 favourite and she can win. Love you Libby in race 2 is a roughie…..Hard to see her knocking this lot off and she’s off to the paddock after this and she is fit so a real rough each wy chance if she can stay the trip. Sams Town in race 3 is on a short 1 week back up coming off a pretty good run last week where he was 3rdup over 2100 mtrs. If he copes with the back-up, he can go well in this race but until they successfully back up, you just never know. I am happy with his work at home and the $8.50 ew is pretty good value in my opinion as he will strip a lot fitter. Race 4 and I think this is a pretty good filly. Greytfilly has drawn a horror gate in 12 or so and things are going to have to work out for her. She is however a class filly and her work at home has been great. She is on a freshen up so perhaps vulnerable but she has a bit of x factor about her. Needs a good ride from the jock but Wiggins has been in great form of late. This filly has had a little freshen up after a couple of cracking runs and a big showing here will see her line up in the Magic Millions Classic worth 2 million! Thirsty For Blood in race 5 is a winning chance also. I was going to put her in the paddock after her last run but she came through it so well it was logical to look at this race for her. The drop back to 1350 is on purpose as she need s a good tempo to produce her best as she can do a lot wrong. She is the $6 bucks 3rdfavourite which about reflects her chances. She is good enough to win but this is a tough race and she is an each way chance if the bugger does not do too much wrong. Gundy Son has been way down on form…..It’s been a long time out of the winners stall and this is a tough race to get back into it! I have liked his work and I reckon hes worth a few shekels each way….. as he seems to have found a bit of his old mojo this past fortnight. The same in the last race….Captain Clayton has also been down on confidence and form. Hes a tricky bugger as he has the ability but hes lost his way this last prep . Probably best to see him run up to his ability before outlaying any hard earned on this bloke…. Plenty of runners but the best value wise are Endless Shadow in the first and Greytfilly in race 4. I will be just happy to get a cheque with the others. Sunday sees the stable well represented at The Sunshine Coast with Crackerjet and Yurrapendi our best winning hopes but seriously, nothing I can recommend a good bet on. A few winning hances but all each way chances only . Pretty handy day with 14 big winners. 4 from Ascot and 4 from Eagle Farm as predicted. From 7 specials 4 arrived so hopefully you managed a result. It was a good start with winners coming early and late. An allup in race 1 from each meeting would have given you a great start with 4/5 winning. Trifectas and First Fours were good and 33 of the 40 winners came from our first fives. Magic runs from Sizzling and Accelarometer were the highlights for me. Looks like all the Brisbane trainers are lining up to get their Xmas presents today. Its always dangerous when a card looks like a favourites day, sometimes it doesn't turn out that way but I am confident that Eagle Farm and Ascot will provide the best results today. A couple of our stable runners include from David Balfours stable in SA AR 7/9 Invincible Gold a blow out chance and AR 8/7 Zaeimus an eachway chance. Joe Pride today has two at Kembla Grange in race 3/4 Acropolis an each way chance and race 7/4 Galator a good chance, worth a small double. Don't forget our stable at esperance today with Steve Rowe who has runners in race 1/12 Get off the Couch (roughie) and 2/5 Aarion Sky which needs to improve. Robert Heathcote is the leading racehorse trainer in Brisbane. 'Rob's Shout' - the personal blog of the multi-premiership and Group 1 winning trainer will appear every Thursday on HRO. Hello once again folks for my final blog for 2012. In fact, I wasn't going to do this one as I have had a pretty frustrating week and yes, it's all to do with the positive swab and the subsequent penalty issued to me and the publicity it generated. I guess I can't complain about the coverage as I am the current premier trainer so news, whether it's good or bad, has to be reported! Yes, I know, each and every trainer who is charged with a rule infringement in racing will say they didn't do it and have no idea how it occurred! Of course they all say they are innocent. Look at the recent offences all around the country and why would Heathcote be any different? How was it possible for a horse in my care to go to the races and win a race, only to later be found to have an elevated level of hydrocortisone which broke the rule of racing and thus caused the horse to be disqualified from its win and resulted in me being fined heavily? As I found in the subsequent stewards enquiry, it did not really matter what defence I put forward as I basically had none because I had no knowledge of the offense in the first place, but as the laboratory found the swab sample positive, that's that … GUILTY! It’s kinda like getting booked for speeding! If you do not think you were and you cannot prove fault with the radar gun … GUILTY. If you have had two drinks and the breathalyser says you are .06 and you cannot prove the machine at fault … GUILTY. I know I did not give my horse any hydrocortisone or instruct my staff or the vets to administer anything and yet it returns a positive swab? Found GUILTY! Hydrocortisone is an endogenous substance which means it exists within the horse. Its primary source is the adrenal gland which secretes the substance as a natural anti-inflammatory against stress. The international standard for the permissible threshold or the normal concentrations is usually under 1.00 mg/ml of sample fluid and above that will be misuse of the substance in an exogenous manner meaning it's been administered by a human … although it is possible to see one horse in 100,000 exceed this natural level without any further administering of the drug! Is it possible this one horse was mine? What is most frustrating for me is the fact that this incident occurred at a difficult time in our industry when there has been a lot of bad publicity. Of course, I got my share of it as well with headlines in the paper and every racing site running the news about my positive swab. I was fined heavily, which hurts, but that’s only money and I will quickly recover from that, but my greatest regret is to have my first positive since I started in the racing industry many years ago and have my hard-earned reputation now tarnished. If my stable practises had led to an error in timing or judgment or animal husbandry, I would accept the penalty, learn from it and move on. This sometimes happens in this industry and whilst it breaks the rules of racing, it maybe does not go into the 'cheating' file as the use of 'tubing' clearly is! It's the not knowing how or why this positive has occurred which most irritates and infuriates me. Strictly on the balance of probabilities in this case, it was a lowly race at Coloundra on a Sunday worth minimum prize money, a horse who was on its final notice to perform or be moved on due to its previous poor form and it was starting at double figures in the betting and unsupported! Even if a malicious act has occurred I fail to comprehend how or why it was on that particular horse. Sure, the cynics will say what a load of crap, he gave the horse some illegal help and got caught, and in fact one trainer at Eagle Farm as much said that to me on Wednesday to my face! That's why this whole incident has left me with such a sour taste. The sour taste comes from the fact that some people think I tried to win a race by illegal means … which did not happen … but I least I can sleep well in the knowledge I know I did not. Anyway, I will get over it as time heals all wounds, as it will in this case. The stewards have a job to do and in this case they had no alternative but to find me guilty and issue a heavy penalty because the Scientific Lab said it was a positive. That's the rules and that’s their job, irrespective of whether I did it or not! Guilty until proven innocent in this case and yes, unfortunately the owners of Slick Image lose their race and I will no longer train their horse. I do wish them well with him in the future. I will always remember the horse … that's a certainty! On a happier note for the week, it was great to see Heza Jetsetter get his just rewards after being denied a win in the previous race, both on the track and in the stewards room in the subsequent race protest. I will always believe he would have won the race against Hi Son but some consolation for the connections to see him back up with a strong win. He has now brought himself into Magic Millions calculations and whilst he will still be at double figure odds in the million dollar race, he will be there and some chance! I was going to take him straight into the race but the five weeks is too long so I have reassessed now and decided on a week to freshen at Washpool in the water-walker, and back for the three-year-old Group 3 Vo Rogue Plate over 1350 at Doomben and then onto the millions race a fortnight later. That's a better plan and whilst the Vo Rogue will be a real quality race, it's at set weights so he drops weight on top of his good winning form! As mentioned, this is my final blog for 2012. It's been another very busy year and unbelievable how quickly it has flown by. Another year older...scary eh! I would like to wish everybody all the best for the festive season. Greetings to you all … and good health. It's the most important thing. A special thank you to Graham Potter who is the host of my blog at horseracing only! A good man passionate about the industry we love! A top day for us with 11 big winners and the trifectas and first 4's keep rolling in. Another winner for the Pride stable with Strada's Diamond hanging on to win in race 4 Canterbury. Thats five winners in a week and they are flying. Keltoi and Destiny's Dance are the 2 runners at Goulburn today. Destiny's Dance will need further as will Keltoi but they are both eachway chances at good odds. Specials were ok with 3/6 saluting and one getting beaten an eyelash. Hope you coupled up the right ones. average days racing for a midweek meeting. We found 10 winners on Saturday but the best results came from Ascot so it was thin pickings early. Some pretty average racing around this time of year on the East Coast but thats to be expected. Not so for the West and Ascot. A great result in the Kingston Town Classic with Lucky Gray rewarded for his consistency. It was nice to see Simon O'Donnell learn his lesson from his Railway Stakes ride so we need to give him credit for that but you have to feel for the connections of Wall Street who was a late scratching at the barrier. Three out of 5 specials arrived but the 2 in Morphetville let us down although I did notice Lightning Drew pulled up very quickly after the race. We had 10 trifectas and 6 first 4's but the highlight was Friday nights double. It pays to check "our news" on a regular basis. To the subscribers that got on board last night at Canterbury - well done. 2 tips for 2 winners at all up odds of 70/1 , it doesn't get much better than that. At Ascot today the Kingston Town Classic race 8 see's Lucky Gray return. The simple fact is if it runs 1800m it wins. The value in the race is Fuddle Me Duddle at odds of $13. She has Glen Boss on board and barrier 2 and represents a live each way chance. Lets face it, the Eastern States jocks are a cut above our boys so you know she will be well ridden. Who can ignore the runs of Zester and Rosies Rocket in the Railway. Both horses are worse off in the race today on weights but I was particularly impressed with Zesters run , side by side with Lucky Gray from last on the corner his run peaked 50 metres from the post. With that run under his belt he may just be the smokey at huge overs. You can't ignore Mr Moet and throw in Maschino for some more value in your first 4. Joseph Pride broke his drought this week on Wednesday at Warwick Farm with a race to race double. As predicted by Warch Racing it is now time to follow the stable. Tonight at Canterbury Joe has My Sabeel in race 6/2 which at $6.50 will be very hard to beat and is a great each way bet. In race 7/7 Gasquet who is a very speedy customer should have no trouble crossing the field and being very hard to run down. Although I welcomed the Meagher racing family to Brisbane many blogs ago, I now want to congratulate them on their first successes here in Queensland this past week. John and his three sons, Daniel, Chris and Paul are welcome additions to the racing scene and I have no doubt there will be plenty more successes to come after their winning double this week. Whilst it was good to see them get a winner, I'm not so sure I was too happy about running second and third to them with their first metro winner on Wednesday at Eagle Farm. The win of Hannibal Ad Portas comes on top of the very impressive win of St Darci last Sunday at The Sunshine Coast. The Darci Brahma gelding bolted in first up after having been transferred to the Meagher team. Legendary Kiwi trainer Alan Jones later reckoned that John and the boys have put three lengths on the horse since the transfer from his previous trainer, but I think maybe he was just having a dig at his old mate BJ? Anyway, Annie and John and their families are a real positive to the local racing scene and I wish them much more success just as long as it's not in my races! They now train out of my 'old' stables at Eagle Farm and there is no truth that the stables are now called the 'Taj Mahal' of Eagle Farm with all of the stable improvements! John is somewhat of a clothes 'fashionista' with the latest designer gear and accessories and it's not unusual to see him in his turbo Porsche visiting the trendy spots of Brisbane and the Gold Coast. The Melbourne Cup winning trainer gets enormous pride from seeing his sons doing well with Daniel and Chris running the racing side of things with Paul in charge of all the pre training on their farm at Guanaba near the Gold Coast. I for one certainly wish them well in their new venture! This Saturday sees the running of the George Moore Stakes and what a beauty it looks like being. Plenty of quality in the race with the likes of Adebisi, Phelan Ready, Belltone, Morning Captain and Startsmeup. Throw in the speedsters Audacious Spirit, Easy Running and even my bloke Excellantes and yes, a top quality race vying the big prize money of a $120 odd grand to the winner. My bloke has drawn the car park as have most of my runners on the weekend so he is going to need an enormous stroke of good fortune to be winning this race. From the alley it looks like being beyond him but my tip for the race is the chestnut son of Shovhog. Since Adebisi has been gelded he's been a revelation and Desleigh has her team flying. Adebisi is fast, very fast and he can back up his win of last year but, like I said, a bloody good race and worthy of black type group status. Little doubt that summer has arrived and wow … with a vengeance! Of course the heat can and does affect the horses so as trainers we must be very mindful of the heat and adjust their training schedules accordingly. It is very important that the horses be well hydrated and yes, they sure do drink plenty when the temps get into the high 30s. I also back off their work significantly but basically it comes down to common sense. The stewards are always very mindful of the heat and they work closely with the vets regarding the safety of horses when the temps climb too high. The race clubs are always very good providing iced water at the tie up stalls to help keep the horses cool pre and post-race but yes, the heat is an important aspect this time of year and they say we are in for another hot one! I see with interest the debate over a return to the grass track at Toowoomba is a hot topic doing the rounds at the moment. I have always been fascinated that the decision is made by the members of the club and not the trainers and owners as well as the members who get to determine their future. I can’t really comment too much on the issue aside from saying I used to make the njourney up the range on a semi regular basis chasing the QRIS riches on the grass track but only the once or twice for the Cup when the synthetic went down. I do not support the cushion track and never will. It has been a failed venture in my opinion but whether it will solve the present bettingn turnover problems on the downs track remains to be seen. If the water problem was the only reason the grass track came up … then it's time to putn it back down! I am saddened a bit with what's going on in the PATINACK camp. The situation must be incredibly tough on the working staff of the organisation and there are many excellent people on their current payroll. For sure there have also been plenty go through their system for whatever reason but I sincerely hope it all works out and they keep going. Maybe it all got to big too quick as the old saying does ring true. It’s called the 'The Sport Of Kings' cause you gotta be a bloody king to afford it and with over a 1000 horses on the books, little wonder the kitty might be a bit short! Their loss would be a huge loss for racing but that's a tough comment on all those people owed money by the mining tycoon living well in Singapore! We have received a recommendation from Robert Heathcote, Queensland's leading trainer. Rob has recommended our web site to all punters in a move which can only add creditability to our site. In addition we have received permission for "Rob's Blog" to be posted weekly on our site by courtesy of www.horseracingonly.com.au which provides a run down and assesment of all Rob's runners each Saturday. He is an excellent judge of where his horses are at as well as the quality of opposition they face. This is a must read and will be published as soon as it is available. You will find this in "our news" tab. A rare insight into Robert Heathcotes racing stable runners each week and our thanks go to him and his team as we continue to improve the value services we can provide to our subscribers and site visitors. A very solid day with 11 winners for the day , 9 trifectas and 4 first fours. Our 6 specials saw 3 winners and 3 seconds arrive. Couldn't believe the results out of Doomben with some long priced winners arriving on a good track. Hope you enjoyed some success on the day. Rob Heathcote is our trainer to follow today. He could train the first 3 winners at Doomben today which are all our top raters and the stable is on fire. Massive day with 12 big winners but from the specials we were even better. We had a super 5 winners from 6 tips and the other selection ran 2nd. Overall from 40 races we found 12 winners 18 trifecta's and 10 first fours making it a great day. If thats not enough our ratings produced the winner from 34 of the 40 races from our top five selections. If you haven't read our theory on "winners are grinners" yet in the ABOUT US tab on our web site then you should do so now. It is about beating the bookmakers on a regular basis and how to win significant money with a small outlay. Read about our theory on all up betting and start reaping the rewards. The results from our specials will keep those who followed us this Saturday going for a long time and have them well in front of the ledger. I trust you were one of them! Looking forward to a good day with Ascot looking like a real favourites day. From the Steve Rowe stable we have 2 runners in Esperance. Steve does his annual pilgrimage to Esperance and has had a fantastic strike rate at the course where he bloods his young horses and gives them vauable race experience. In Race 2 no 3 Aarion Sky will have his first start after an exceptional trial. This horse will be very short in the market but should just win. Good luck to Steve Brooks with his first runner for some time. In race 6 no 1 Classitheatre represents the stable and carries 59kgs but will get the benefit of Ellie Cockram's 2kg claim and could well be the second leg of a Steve Rowe double.